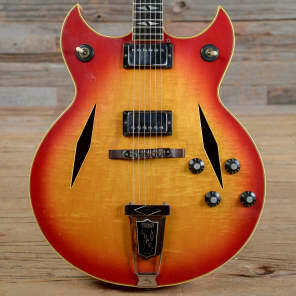 The Trini Lopez Models were made by Gibson between 1964 and 1971. Trini himself played the Trini Lopez Deluxe (Custom) Model. This one had a deeper double cutaway and a curly maple top, back, and rim with cream binding and bound, diamond-shaped sound holes. A mahogany neck joined the body the 17th fret with diamond-shaped pearl inlays on a 20 fret, ebony fret board. The Deluxe had two hum bucking pickups with a standby switch and sported a tune-o-matic bridge on a rose bridge-base. 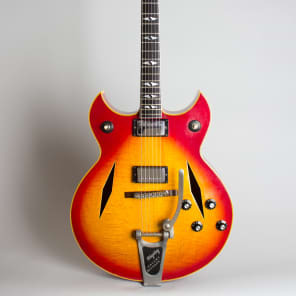 The 24 ¾” scale guitar was 17" wide and 3" deep, was manufactured in a cherry sunburst finish, and featured, at Trini's suggestion, 6-to-a-side tuning keys in the Fender tradition. Take the GIBSON Trini Lopez Deluxe price survey. 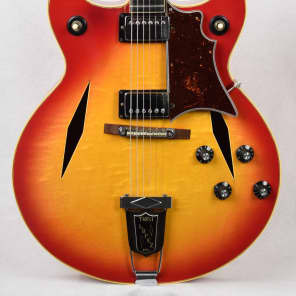 Gibson Trini Lopez Deluxe Arch Top Hollow Body Electric Guitar (1968), ser. #895389, original black hard shell case.